NaBloPoMo (nah-blow-POE-moe) is a blog-centric riff on NaNoWriMo. (nan-oh-WRY-moe). Lest you think I am writing gibberish, let me expand. 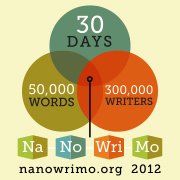 NoNoWriMo stands for National Novel Writing Month –which occurs annually in November. Their tag line is “November 1-30, 2012: thirty days of literary abandon!” Joining is free–over 300,000 writers do join–and you are linked to local NaNoWriMo chapters, where you will be invited to Write-ins at local coffee shops and library, as well as kick off and wrap up meetings throughout the month. During your month of abandon, your goal, should you choose to accept it, is to produce a “novel” of at least 50,000 words. “No plot? No problem!” is the e-book playbook that the NaNoWriMo founder wrote. The point is, to get yourself started writing and once started, don’t stop. If you complete 50,000 words (verified by uploading the files, which can be encrypted to protect your manuscript), then you get bragging rights as a 2012 NaNoWriMo WINNER! And can display a badge saying so. You can also buy tee shirts, posters, thermos, and other motivating at their online store. Whole families have been known to NaNoWriMo together, all month. Many writers repeat. Participation is international at this point–wrimo’ing has been going on for years. There are so many WriMo writers that Amazon’s CreateSpace has created a special offer for Nanowrimo writers to self-publish their novels, should they have a palatable product. I had planned to WriMo this month. and benefit from the forums and motivational “lectures’ and meetings that are organized locally. However, Hurricane/Tropical Storm Sandy hit hard here in Central New Jersey, and without power the beginning of the month, it was a challenge to start off strongly. So if you wondered why my posts have been more frequent, I am posting daily, in the spirit of a rained out NaNoWriMo, happily tucked in the organization of a NaPBloPoMo. Enjoy!